The aim of prenatal singing is to support women during pregnancy, birth and post-natal. This original approach enables pregnant women and professionals working with pregnant women to explore the rich potential of specific voicework, vocal sounding and singing during pregnancy, at birth and post-natal. Prenatal singing was developed through Psychophonie, a unique and holistic approach to singing created in the 1960’s by Marie-Louise Aucher, a French classical singer and musician. As a singing teacher, she became interested in how some of her pregnant singing students were benefitting from psychophonie. She believed that all human beings were very receptive to sound vibrations and particularly the baby in the womb. In 1976, Doctor Michel Odent who was working in a maternity unit in Pithiviers, France invited Marie-Louise Aucher to lead weekly prenatal singing workshops. In the same year, a midwife who Marie-Louise Aucher had trained created a prenatal singing group at the well known maternity hospital ‘Les Lilas’ near Paris. Both these workshops still exist. Prenatal singing has since successfully developed in France and is now gathering a lot of interest in Europe. Training in prenatal singing is available for anyone who is interested in running prenatal singing workshops for pregnant women and for any professional work with pregnant women including midwives, doulas, health centers and maternity hospitals. 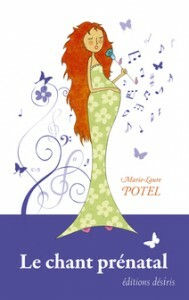 Marie-Laure Potel, a French musician, a psychophonie trainer with over twenty years experience and a pioneer in prenatal singing in France, has written the definitive book on prenatal singing. This comprehensive and clearly written book is only available in French for the moment. People who read French can order this book on the internet.